There are a broad range of pins for maps, charts and noticeboards or everyday home and office use available. All pins are packed in handy, re-usable plastic packs. Quality push pins at a Deli..cious price. Standard push pins suitable for maps, charts and notice boards. 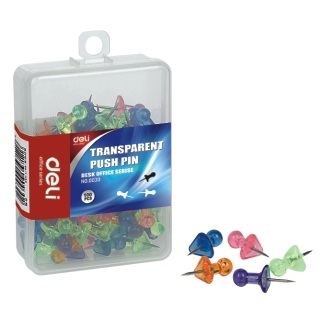 100 push pins in a handy, plastic re-usable pack. 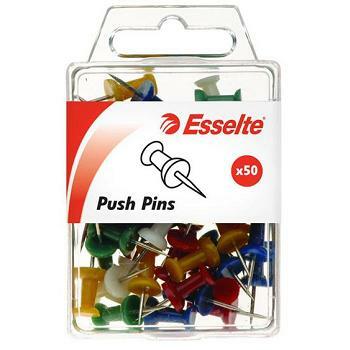 Esselte Pins are easy to use and have so many applications. Size - Brass 11 mm head diameter & 7 mm pin length. 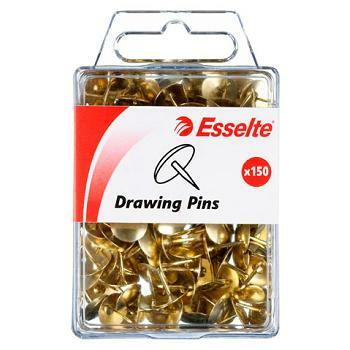 Pack of 150 brass drawing pins. Quality Drawing Pins in assorted colours. Size - 10 mm head diameter & 9 mm pin length. 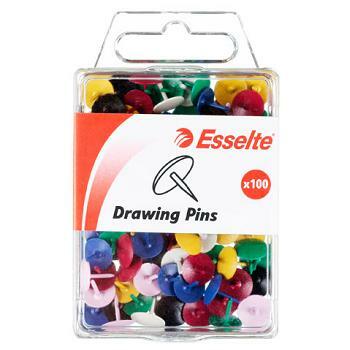 Pack of 100 assorted colours drawing pins. Quality Chart Pins in Assorted Colours. Size - 8 mm diameter head & 22 mm long. 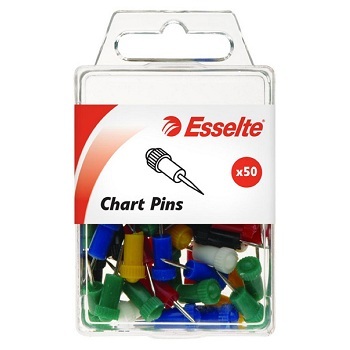 Pack of 50 assorted colours chart pins. 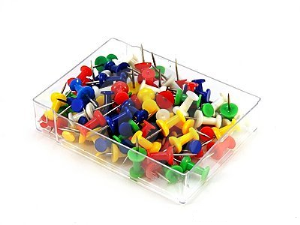 Quality Push Pins in Assorted Colours. Size - 8 mm head diameter & 20 mm pin length. 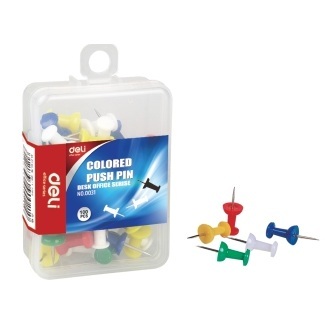 Pack of 50 assorted colours push pins. 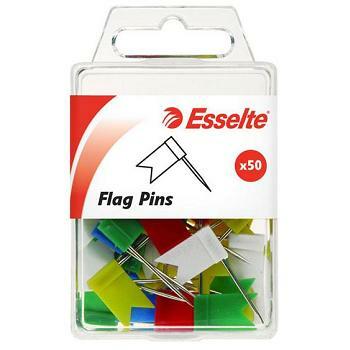 Quality Flag Pins in Assorted Colours. Size - 10 x 18 mm head & 33 mm pin length. Pack of 50 assorted colours flag pins. 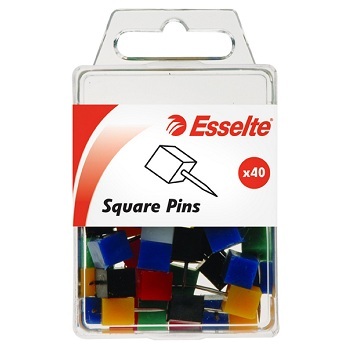 Quality Square Pins in Assorted Colours. Size - 8 mm square head & 19 mm long. Pack of 40 assorted colours square pins. Quality Small Indicator Pins in Assorted Colours. Size - 15 mm diameter head & 13 mm long. 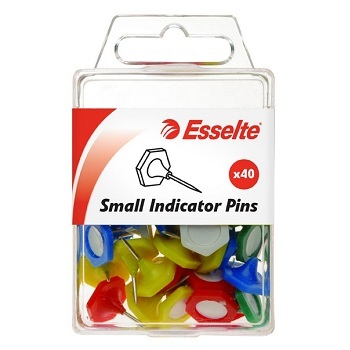 Pack of 40 assorted colours small indicator pins. Quality Large Indicator Pins in Assorted Colours. Size - 20 mm diameter head & 24 mm long. Pack of 20 assorted colours large indicator pins.